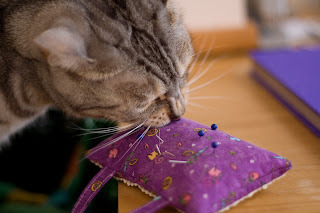 Meyer Lemon Designs: Sewing Project - Oven Mitts! It's the weekend again! Yay - that means more time for artsy projects. This weekend I'm working on a project using my favorite designer fabrics, Amy Butler Designs! Today was assembly day. I did all the washing, ironing and cutting for the oven mitt project in Amy Butlers book InStiches. Tomorrow I will finally get to sew! I went to Fabric Place to get batting and grommets, and ended up with some additional fabrics from the bargain bin! Gotta love the piles of fabric options. So hard to resist!! These were particularly nice. Fabric Place has such a great selection. What are you doing Sherman!! Oh I just love Amy fabrics, I'll check back to see comleted projects-so fun! !